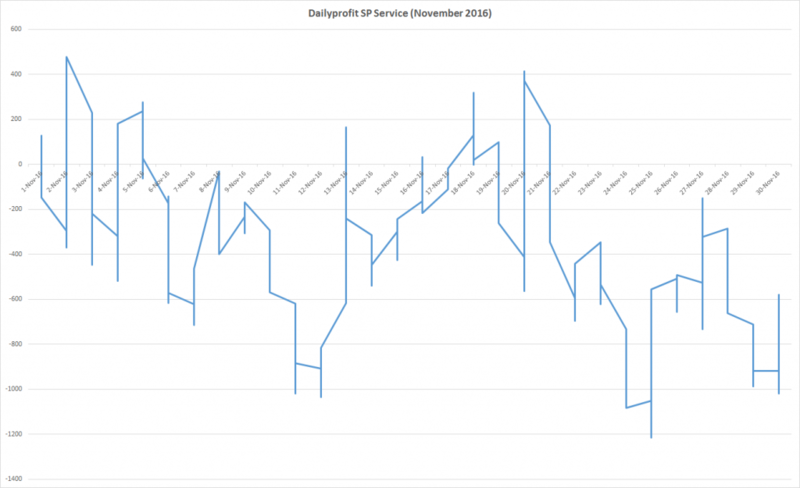 After a profitable two months, we see a loss in November. There was a tiny profit for the NBA model, but a 7.25 unit loss for the NFL. In total, we placed 237 bets and won 116 of them (50.7%). We placed bets totalling 282.90 units ($22,290.00) and lost 6.8404 units ($684.04). That is a -2.42% ROI. The previous update was a +1.8574 unit profit. 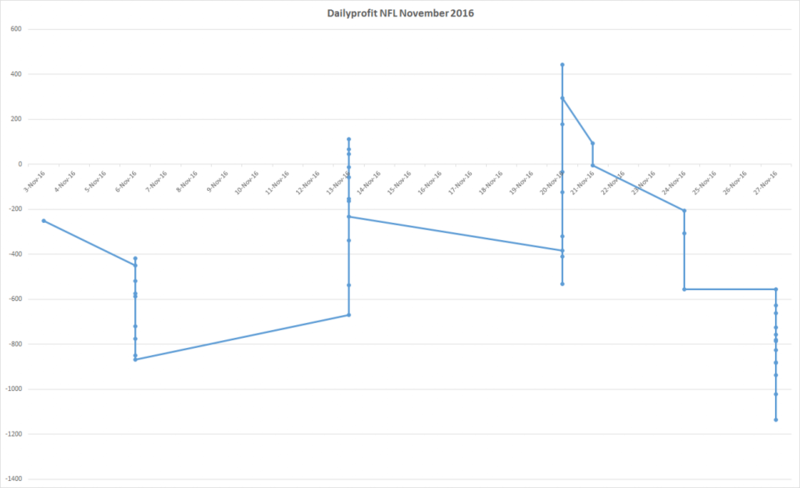 The NFL has been on a very poor run and that continued in November with a 7.2567 unit loss. We bet 84.75 units and lost 7.2567 units for a -8.56% ROI. We placed 50 bets and won 20 of them (44.4%). The Line bets were the contributing factor to the loss. Line bets hit 6 from 19 (31.6%) and lost 7.451 units at -20.6%. Totals bets went 14 from 27 (51.9%) and made 0.1943 units profit at 0.4% ROI. 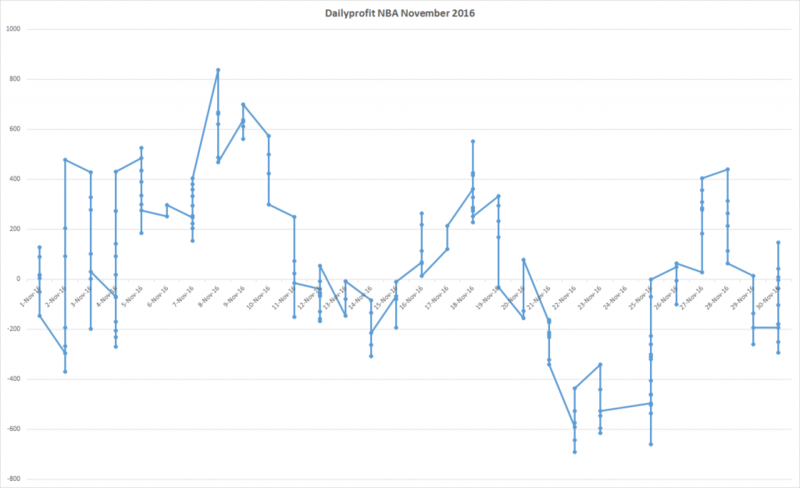 The NBA started at the end of October and begun with a bang, making 18.3 units in the last few days of October. Sadly, November was all about treading water, and the model only made 0.4163 units profit at 0.21% ROI. We bet a total of 198.15 units ($19,815.00) and made a profit of 0.4163 units ($41.63). The Head to Head bets were the disappointment, with a turnover of 74.40 units and a loss of 5.9920 units at -8.1% ROI. The Totals did well with 123.75 units turnover and a 6.4083 unit profit at 5.2% ROI. We hit 62 of 109 (56.9%) of totals bets. A poor November and just the final month of 2016 left. It really has been a treading water kind of year. No huge profits, but no huge losses either (depending on what models you follow). 2016 has seen 1,577.825 units bet for a return of 17.6457 units at 1.12% ROI. Not spectacular at all but a profit nonetheless. It’s been a disappointing season and we will hope for a strong finish in December and to be above the 2% ROI figure in 2017.